Server cloning is a useful tool, for example, for creating new web servers behind your load balancer. It is also useful if you just need to set up a server similar to what you already have, and wish to skip the hassle of configuring a new server from scratch. There are two ways to clone a server: custom images and backup cloning. Depending on your desired use, you might want to use one method over the other. Custom images are carbon copy templates of the system storage device on your server. They are an ideal way for horizontally scaling your services as your usage grows. The initial imaging process does require the server to be shut down but afterwards, you can deploy new servers without interruptions using the custom image. Backup cloning allows you to duplicate your storage devices even while in use with zero downtime. Any backup of your server, scheduled or manual, can be cloned onto a new storage device. The cloned storage can then be attached to any existing server. If your original server has several storage disks, you should clone the system disk first using custom images and then clone and attach any additional devices. Before cloning a server, you should check your server to make sure everything is working as expected. For servers running CentOS 6.7 or older and Ubuntu 12.04 or older, will need you to rename the current MAC address reference file to avoid extra reboots. The system will generate a new file again on the next reboot. Other servers with OSs different from those mentioned above, such as any newer Linux distribution or Windows Servers, do not need any special preparations for cloning. Note that the server being cloned must be shut down during the imaging process. To start cloning a server, log into your UpCloud control panel and shut down the original server. Then open the Storage devices list and find the system disk attached to your source server. Click the copy icon to create a custom image of the system disk. Name the custom image as you wish, then click the Create button to confirm. The imaging process will take but a moment depending on the size of the source storage. Your server state will show in maintenance until the operation has been completed. Once the server is again in the stopped state, the custom image is ready and you can power up the server. Next, go to your Custom images list and click the Deploy button. This will open the new server configuration view with the custom image preselected. You can then choose the server plan, add new storage devices, and name the server. The only restrictions are that the system storage on the new server must be the same size as the original server and it’s deployed to the same location. Any SSH keys you had configured on the source server will be usable on the clone as well. When you are done with the selections, click the Deploy button to get going. Cloning a backup onto a new storage device is useful if you wish to access only specific files on the backup or want to duplicate the content for a new host. The time and date of when the backup was taken pose no restrictions on cloning the data. Depending on your backup schedule, you may wish to create a new manual backup for cloning. Go to your server settings and backups tab. 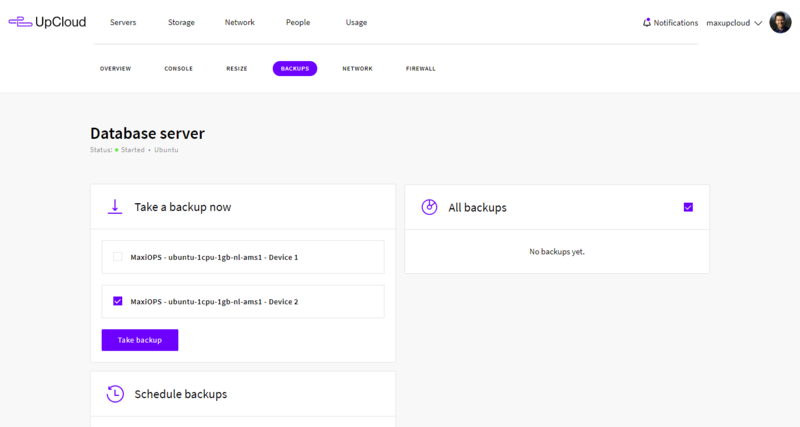 Select the storage devices you wish to backup and click the Take backup button. The backup snapshots are a quick and easy way to save the state of your storage devices. We recommend always taking backups before performing critical operations on your cloud servers. Next, go to your Storage backups list and find the latest snapshot of the storage you want to clone. Click the copy icon to clone the backup. Give the clone a name you’ll recognise later and finally click Accept to confirm. The cloning process will take a moment depending on the size of the source device. Once completed, you can find the new cloned disk unattached on the list of your Storage devices. Cloning your cloud server means that the data is copied from one disk to another as is. All of the OS-level configurations will be exactly the same. This includes your usernames, passwords, and any SSH keys you might have added to your original server so that you may log in to the new cloned system just as to the original. However, once logged in, you might need to make some changes to the new server’s configuration such as updating the hostname. On Ubuntu and other Debian based distributions, open the hostname file for edit. With CentOS and other Red Hat variants have the same hostname file. Replace the old hostname with a new one, save the file and exit. Afterwards, reboot the server to apply the name change. If you cloned one of the older CentOS or Ubuntu distributions mentioned above and run into networking problems, try removing references to any old MAC addresses in the file /etc/udev/rules.d/70-persistent-net.rules and reboot to apply the changes. If the issues persist, check out our guide for troubleshooting networking on Linux servers. Windows servers should work as is straight out of cloning. If you find issues with network connectivity, check that your network interfaces are turned on and working.